Photograph of the floor plan for Dr. Hunter Oke's home. Blue print states: "Henry Neale Allandale, Ont." Contains front elevation, side elevation, cellar plan, first floor plan, second floor plan. 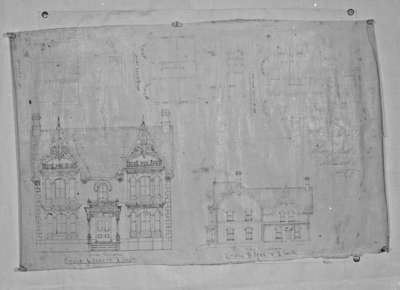 Dr. Hunter Oke Plan of House, c.1945, Marjorie Ruddy. Whitby Archives A2013_040_1071.